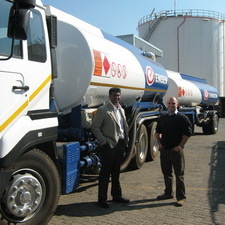 Engen Alrode depot manager Nick Murugan with Aluvinâ€™s Rory de Nobrega. So seriously does the Engen Alrode depot take its security that it is using a Dragon to help it in this mission. “Aluvin’s ‘˜Dragon’ security seal has helped us keep fuel theft at remarkably low levels,’ says depot manager Nick Murugan. Coming from someone who is responsible for the dispatch of around 35 million litres of bulk fuel per month from its fleet of 14 fuel trucks, this is praise indeed. The Dragon Seal, each with a unique printed number, is designed for optimal tamper-evidence. It features an easy-to-apply metal locking mechanism and large flap area, making this one of the most practical seals for high-security applications. “In short, the seals are locked on the vehicles’ bottom loading points and on the top domes and the numbers are recorded when leaving our premises. The customer then, on delivery, checks that they are intact and verifies the numbers,’ says Murugan. The seal is widely used for airline cargo, bank and postal services, clinical waste management, hazardous material transport, courier services, cash-in-transit and other applications requiring high pull strength. It is also available in a long version where extra length is required. Aluvin is the sole distributor in Southern Africa for some of the largest security sealing companies in the world. Its head office and factory are in Germiston with distribution centres in Durban and Cape Town.